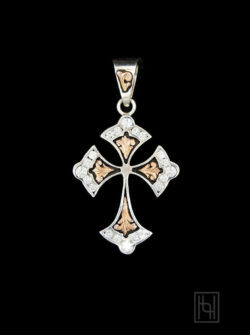 Rose gold scrolls flow around the sterling silver border of this classically designed Violet Cabochon Budded Cross Pendant. A black antique background adds contrast to the brilliant hues of the precious metals and vibrant stone color. Sterling Silver and 1/10th 10k Rose Gold with an Oval 8 mm x 6 mm Created Violet Cabochon in a Bezel Setting and Black Antique.